Innovation and high quality watchmaking are combined in the new L’Astronomo - Luminor 1950 Tourbillon Moon Phases Equation of Time GMT, the latest creation dedicated to Galileo Galilei. A Luminor 1950 case, whose iconic design is part of the fascinating history of Officine Panerai, encloses a concentration of technical solutions which demonstrate the ability of the Florentine brand to interpret traditional complications in ways which are always distinctive, bringing innovation into the world of high quality sports watchmaking. 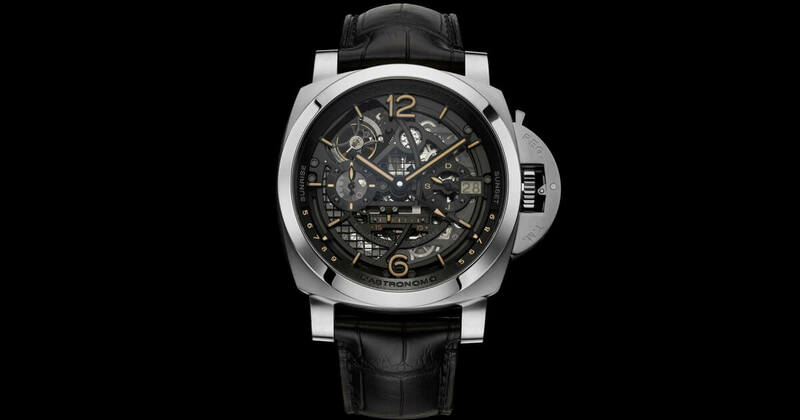 The first Panerai L’Astronomo, presented in 2010 on the occasion of the 400th anniversary of the celestial observations made by Galileo as a result of the invention of the telescope, was the first timepiece created by Panerai with a tourbillon regulator, calendar, equation of time indication and the display of the times of sunrise and sunset. 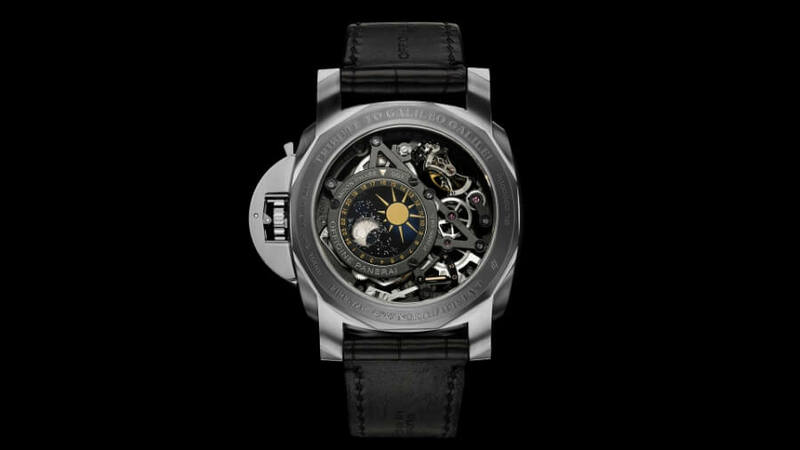 Like its predecessor, the new L’Astronomo - Luminor 1950 Tourbillon Moon Phases Equation of Time GMT is made to order, and the skeletonised movement, the P.2005/GLS (standing for Galileo Luna Scheletrato), is personalised to operate in accordance with the geographical coordinates of a place chosen by the client. 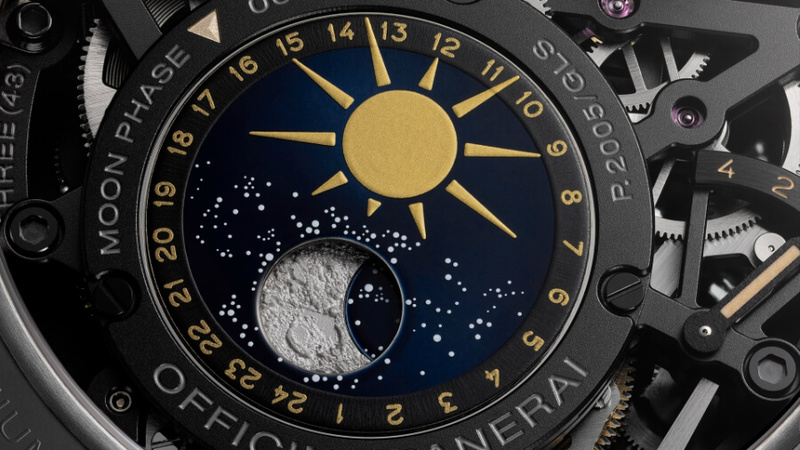 It provides the same range of remarkable functions as the first L’Astronomo, and in addition, GMT and two other innovations: indication of the phases of the moon and an original system for displaying the date using polarised crystals. Thanks to the invention of the telescope, Galileo made revolutionary discoveries concerning the appearance and the movement of the moon. He made remarkably beautiful drawings of what he saw with an accuracy and attention to detail which is still amazing even today. So in a timepiece dedicated to him, nothing would be more logical than moon phase indication, a classic complication of high quality watchmaking which Panerai has interpreted in its own way and with an accuracy of a century. On the back of the new L’Astronomo’s P.2005/GLS movement is a day/night indicator which also clearly displays the phases of the moon, by means of a system consisting of two superimposed discs which rotate in combination. The upper disc – which is read by a small external index fixed onto the movement – displays the 24 hours of the day, showing the sun during the hours of daylight and the stars of the sky at night. At the centre of the starry sky is a little round window through which the lower disc can be seen; on this appears the moon, its shape evolving day by day as a result of a small supplementary rotation of this disc of about 6.1° per day, a figure based on the exact duration of one lunar cycle (an average of 29 days, 12 hours, 44 minutes and 3 seconds). Given that each watch movement is made according to the coordinates of a place chosen by the watch’s owner, the indication of the moon phases always relates to the sky above that place, and of course it also takes account of the difference between the earth’s northern and southern hemispheres. Like the moon phase indicator, the indicators of sunrise and sunset times are connected to home time and therefore, if the owner of the watch should find himself in a city with a different time zone from that of the chosen city, these indicators will continue to show the situation at the time at home, which is indicated by the GMT hand. Finally, at six o’clock is the linear indicator of the equation of time, which displays the difference between actual time (solar time) and conventional time on each day, this period ranging between plus 15 minutes and minus 15 minutes, according to the time of year. 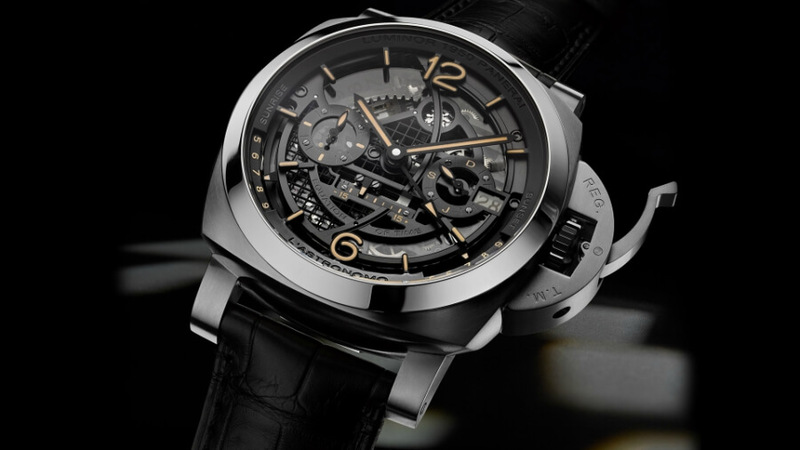 As well as the moon phase indicator, the hand-wound P.2005/GLS calibre also has the characteristic Panerai tourbillon escapement, which can be admired both from the front as well as from the back of the watch thanks the sophisticated work of skeletonising the movement and the absence of an actual dial. All the elements which would be found in a traditional dial appear on the movement or the flange, and the two spring barrels, which store enough power to last at least four days, are visible through the open back, which also enables the power reserve indicator mounted on the movement to be read. In a watch with this construction, a date disc designed in the traditional way would to some extent conceal the fascination of the skeletonised movement, because it would cover part of the components. The Laboratorio di Idee at the Manufacture in Neuchâtel has therefore designed an innovative system – pending patent by Panerai – in which the date disc is made of borosilicate glass and the numbers of the days have laser-modified optical properties. The numbers are virtually invisible in all positions except for the one that is aligned with the little date window, where a further polarized crystal, situated above the date disc, causes the number to appear so that it is perfectly legible. 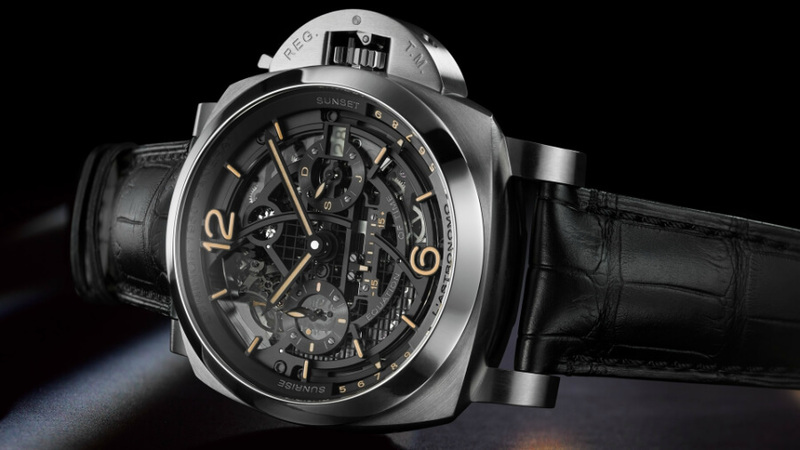 In the system patented by Panerai, the tourbillon’s rotation is different from that of the classic tourbillon. The cage of the balance rotates continuously on itself, to correct any alterations caused by gravity and possible friction. 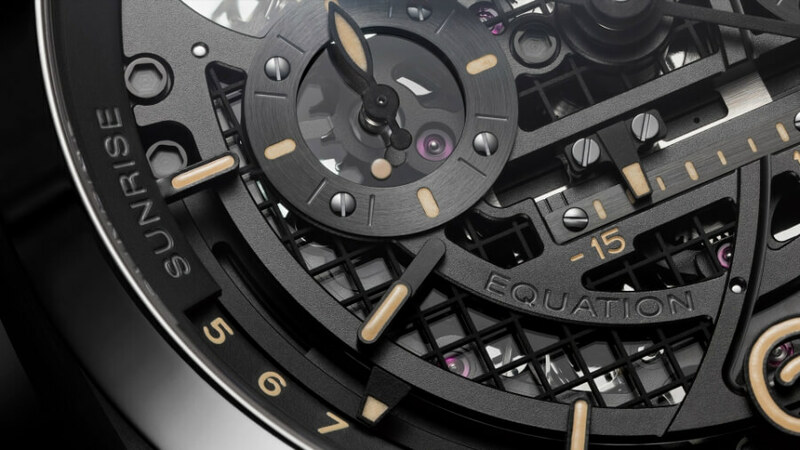 In this innovative mechanism patented by Panerai, the cage rotates on an axis at right angles to the balance, not parallel with it. Also, while the traditional tourbillon rotates once in one minute, that of the P.2005/GLS rotates once in 30 seconds, and its rotation can be seen by an indicator in the small seconds counter at 9 o’clock. The higher speed and the particular arrangement of the mechanism mean that any possible alterations of rate are effectively compensated, resulting in more accurate timekeeping. 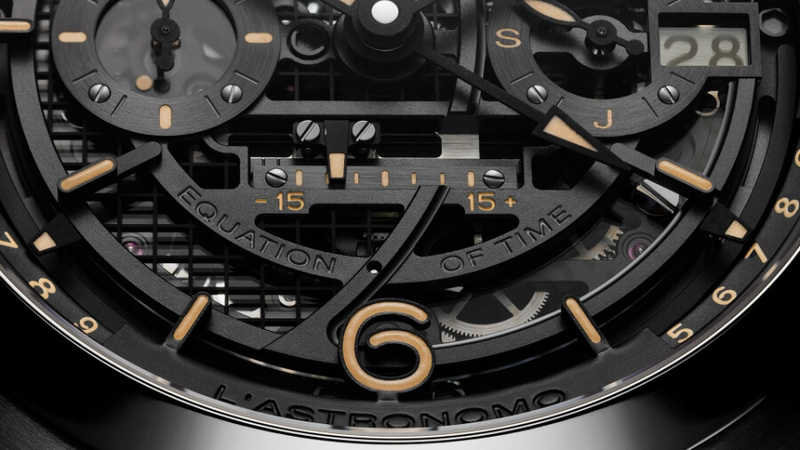 As well as the technical personalisation of the P.2005/GLS movement, the new L’Astronomo - Luminor 1950 Tourbillon Moon Phases Equation of Time GMT also provides the opportunity of selecting the material and finish of the case, the colour of the hands and that of the Super- LumiNova which makes the watch’s indications extremely readable even in the dark, as well as the colour of the alligator strap. In this way each client can create an individual watch of great character and elegance, for example choosing between a red gold or a white gold case, or the brushed titanium case of the basic version of the L’Astronomo for a more sporty and functional appearance. In each instance, the watch is water-resistant to 10 bar (a depth of about 100 metres). Movement: Hand-wound mechanical, P.2005/GLS calibre, executed entirely by Panerai. 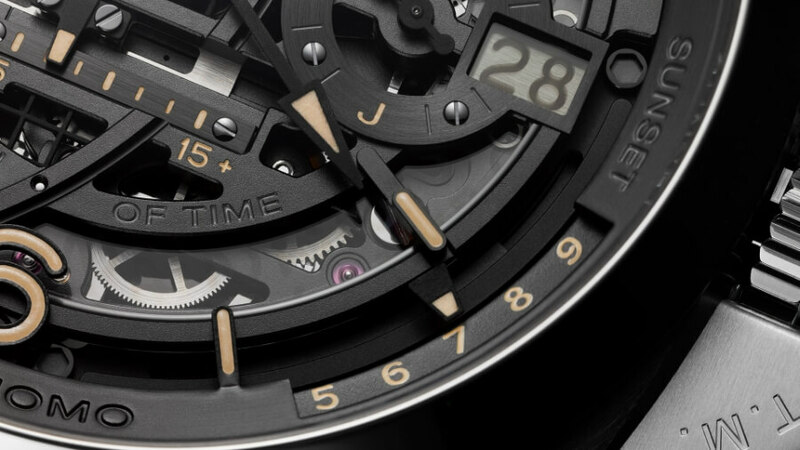 Functions: Hours, minutes, small seconds, date, month indicator, GMT, power reserve Indicator on the back, equation of time, sunrise/sunset times, moon phases indicator on the back, tourbillon. Case: 50 mm, brushed titanium. For more visit Officine Panerai Online.